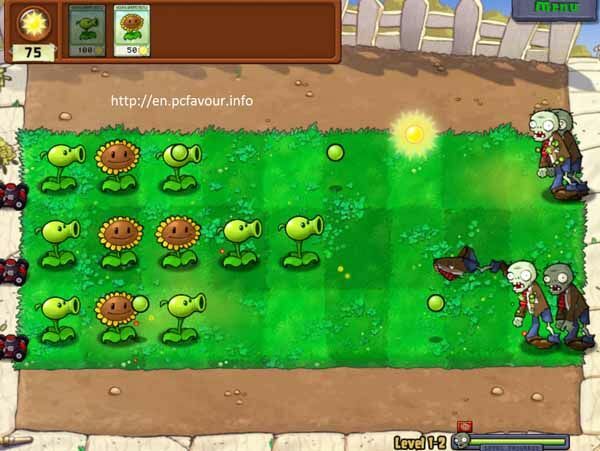 Free download Plants vs. Zombies game for your PC. It is quite different type of shooter game developed by PopCap Games. In this game, your shooters are plants against zombies. Game installer is very easy as it has designed with neglecting some common options e.g. default directory option. If you want to change the storage directory (which is not necessary) then you can select “Change Settings”. After that, you have to accept the License Agreement as usual. The installation process will take few seconds and add a shortcut of the game on desktop without asking you along with a shortcut link of PopCap official site. Plants vs. Zombies will start in windowed mode. You can start trial or buy full version from available options. Actual game will start in full screen modes. The graphics of the game are amazing with cool animations and fonts styles. There are four modes of games; Start Adventure, Mini-Games, Puzzles and Survival. Playing adventure mode, you have only shooter plant at level-1. You need to plant it to rescue your house from zombies. This level has only single row of path. You have to plant shooter plant in a row. To plant more shooter plant, you need sunshine which falls from sky and you have to collect it by clicking on it. These plants will start shooting automatically when any zombie arrives at the path. At the end of level-1, you will get new plant sun flower. This plant will help you to generate extra sunshine to plant more shooter plants because the number of zombies will increase at level-2 as well as the number of path too. Frist seen think so playing for android only.